Dell Business Thunderbolt Dock - TB16 with 240W AdapterThe Dell Business Thunderbolt Dock - TB16 with 240W Adapter allows you to quickly connect your mobile workstation to a single data and power source for ultimate display performance and speedy data transfers. The dock connects to Thunderbolt™ 3 enabled notebooks* with a single USB Type-C Thunderbolt™ Cable, allowing users to quickly connect to multiple displays and peripherals, providing power to the notebook, and freeing up space on your desk and in your workspace. 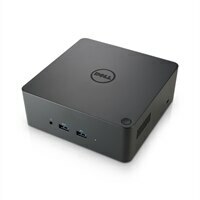 * While Dell has committed to ensuring the TB16 meets open standards, 3rd party OEMs can limit compatibility.